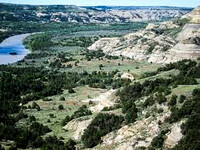 Theodore Roosevelt National Park includes three geographically separate units located in western North Dakota on the badlands. The Little Missouri River runs through all three units of the park, with a combined total of 110 square miles. Theodore Roosevelt, an avid sportsman, originally visited western North Dakota to hunt for bison in 1883. It is during those first hunting trips that Teddy Roosevelt began to form a solid conservation ethic as he witnessed an extreme scarcity of wild bison in the region. In 1978, nearly 100 years after Teddy Roosevelt’s first visit to North Dakota, the Theodore Roosevelt National Park was officially designated as a National Park. Visitors to the Park enjoy vistas of a rolling prairie that turn into a maze of scoria buttes and winding river valleys. Historically, the buttes of North Dakota provided waypoints for travelling tribes. These lands also provided an abundant source of bison meat, medicinal plants and clay for pottery. The vast grasslands that surround the Theodore Roosevelt National Park are commonly used for farming and ranching. The badlands are rich with wildlife, cultural history and geological interests. Above the ground it is one of those unique places in the U.S. where you can still catch a glimpse of horses in the wild, see an endangered bald eagle or find a Sioux arrowhead. Below the ground lies a 200,000 square mile ancient sea-bed of oil-rich shale called the Bakken Formation. The development of oil and gas surrounding the Park has changed the sense of solitude that visitors have been accustomed to enjoying. The Badlands Conservation Alliance has proposed wilderness areas next to the Park in an attempt to create a buffer against the industrialization of this cultural and biological gem.